Starting only by alphabetical approach, the first cab off the rank is inevitably Accuphase. However this brand founded by in 1972 by Jiro Kasuga in Yokohama has much more to its ranking than alphabetisation. For decades this manufactorer has served across the spectrum withuncompromising quality high-end components, their invantory includes not only separate pre- and power amplifiers also discussed here integrated amplifier. Last year it was the previous top model in this category, as after about five years the E-560 was given an update and was replaced by the Accuphase E-600. Fully committed to its own tradition the current model again graces the classic champagne-coloured front with the green glowing logo. The modifications of the designs compared to its predecessor are manageable and mainly concern the VU Meter that are now given way to two bar graphs. In addition this centrally located digital segment display is flanked by several status lights from the individual operating modes. Besides are the two knobs to select the source and to adjust the volume, the front reveals few visible buttons, all other controls are hidden behind a flap. Furthermore the E-600 has an integrated headphone amplifier – a unique selling point in the discussed models. 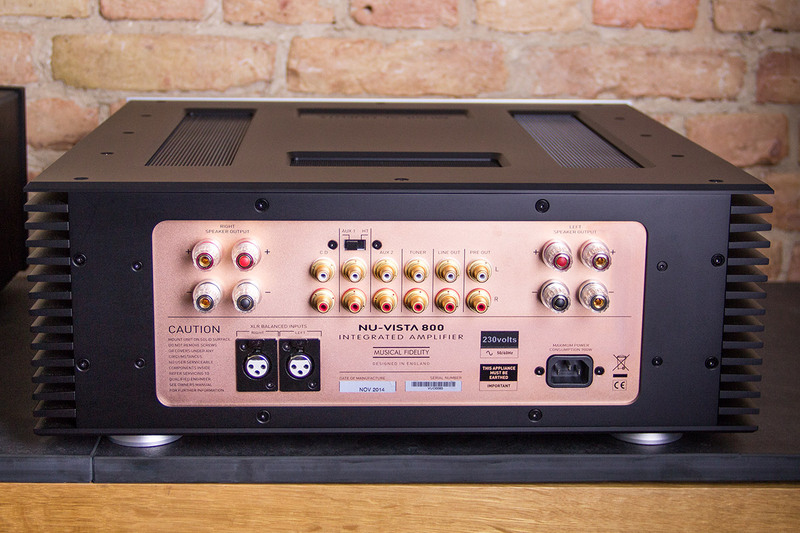 The rear connection panel of the E-600 is quite lavish, both balanced and unbalanced inputs and outputs are available for all possibilities. As with the previous model it can be optionally retrofitted per map with both a phono preamp (AD-30) as well as a digital-analog module (DAC-40). 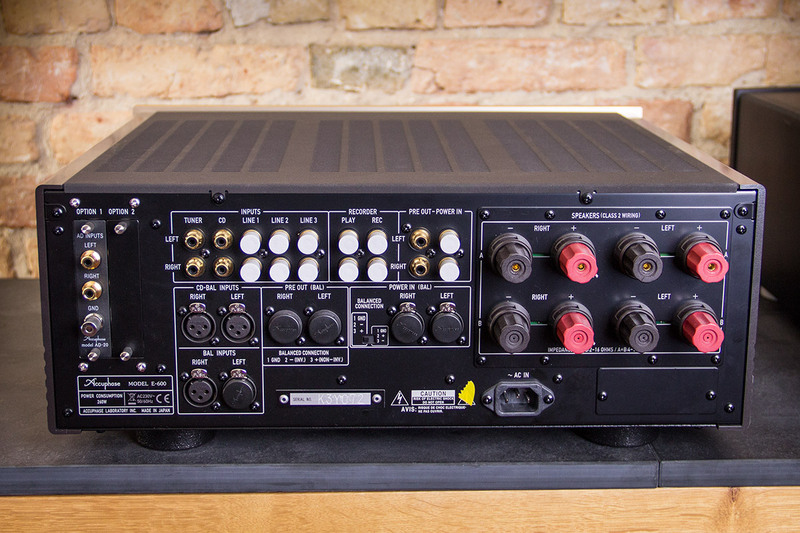 The latter is equipped with Burr-Brown PCM1796 converters and can be fed via coaxial cable, or even better a TOSLINK connection or with USB data. Additionally, a double occupancy of the expansion slots is possible if needed. The final power amplification of incoming signals assumes once again a MOS-FET transistor circuit in triple parallel execution, which can be operated in extremely low-distortion Class-A and in this case supplies a maximum of 30 watts per channel into 8 ohms (or 60 watts per channel into 4 ohms or 120 watts per channel into 2 ohms). On the other side of the globe, and more specifically in New Haven in the US state of Connecticut, the also 1972 created company, the musically versatile Mark Levinson brand. 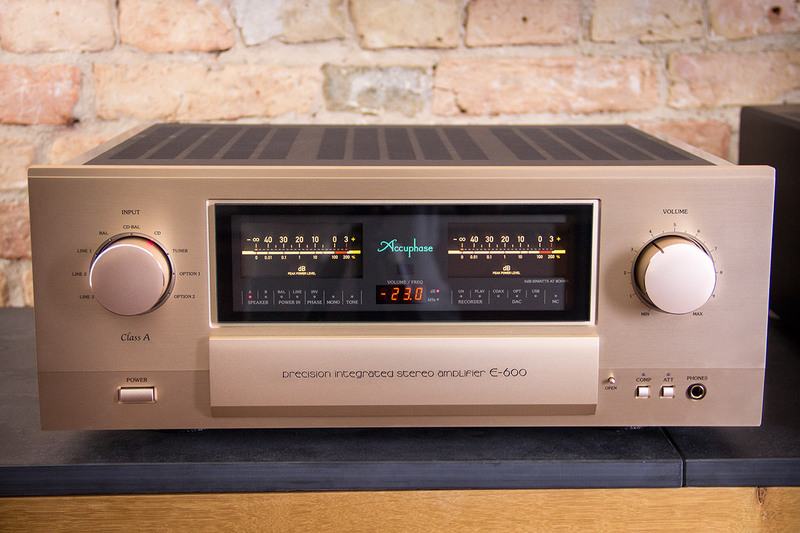 However the company’s history is less straight forward than Accuphase because in 1984 Mark Levinson left the company after quarrels with investors. 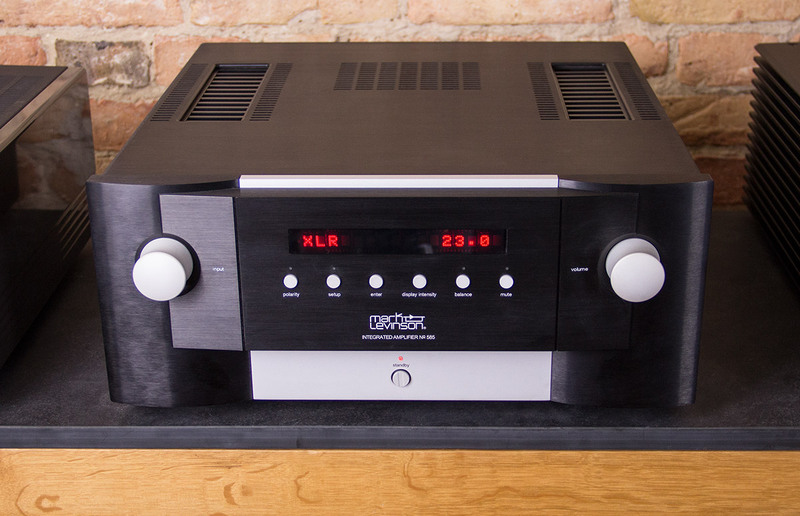 Due to naming rights at the time, the brand remained producing even after Levinson’s resignation under the brand Mark Levinson and there actually were able to continue to match the weighty name of the founder. Since the 1990s, the company is an integral part of the Harman Luxury Audio Group and after more than four decades, an integral part of the hi-fi world. At last year’s high-end trade fair in Munich the latest Mark Levinson No. 585 Integrated Amplifier was presented. Compared to the very classically designed Accuphase front that radiates a certain warmth and includes quite a lot of elements and information, the No. 585 extremely modern, tidy and rather cool. The display and the controls have been reduced to the bare essentials. Precious shimmering black dominates, interrupted by gray accents and luminous in bright red digital display. Despite the minimalist approach of the ease of use does not suffer, the navigation is thanks to the sensible and shallow menu structure is used quickly by hand. In keeping with the modern high-tech aesthetics of the Mark Levinson No. 585 there is an extremely flexible and sophisticated digital interface helped by the fact that it has processed a plurality of inputs and both PCM and DSD-coded signals (up to 32 bit / 192 KHz or DSD128). Furthermore, various algorithms and filter modes – Clari-Fi compressed data and three PCM filters – are available to enhance digital signals or to influence their sound characteristic subtle. As if that were not enough, the No. 585 has a whole set of interfaces for implemented: From the classic control by remote control to the network-based home automation is much here to implement. The Mark Levinson No. 585 is designed as a dual mono amplifier, delivering a whopping 200 watts into 8 ohms, however, works in contrast to the Accuphase E-600 only in Class AB operation. 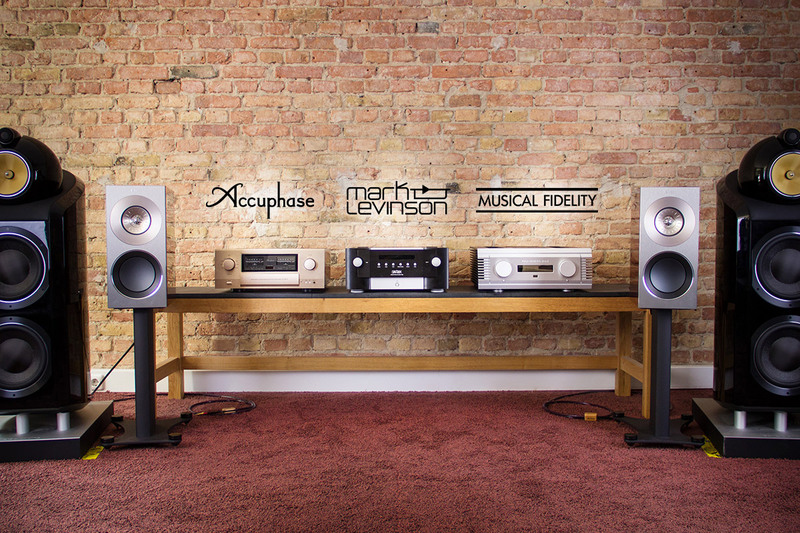 As the studied musician Michael Anderson in 1982 in British Middlesex decided that his own version of High Fidelity should be realized, Accuphase and Mark Levinson audio systems had been around on the market for a decade and of course they were not the only ones. Accordingly, he also received the same well-intentioned advice from several quarters that the market is saturated and thus condemned his plan to fail. However, Anderson decided to trust his instincts and thirty years later it can be stated without hesitation that he has made the right decision. His Musical Fidelity company has developed over the years into one of the big names in the industry and can also look back on a number in the scene that have become classics known that earned the brand the trust of many of sensitive listeners. 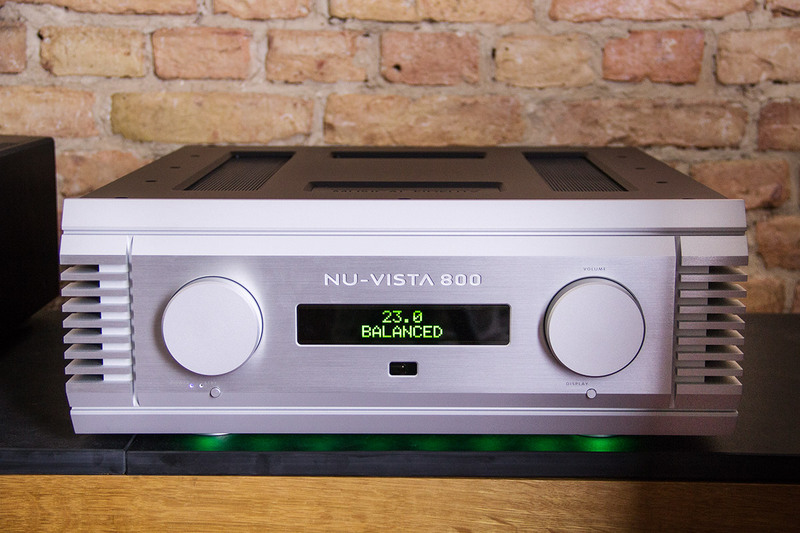 This category could in future perhaps even the 2014 also appeared Musical Fidelity NuVista 800 – the resurrection of a promising, but due to an acute shortage of components unfortunately far too quickly ended the experiment of the Musical Fidelity history. The component in question it was the base version of the already built in the late 1990s in the NuVista series Nuvistor tube, a variant of the classical electron tube having particularly advantageous properties. The convincing sound of the then strictly limited components made such a lasting impression in the team of Musical Fidelity, which tried to make this more stocks of these versions to locate and buy up in recent years. Apparently they were going very successful, because the Nuvistor tube is now reinstalled and shapes the sound in the preliminary stage of NuVista 800. Thus, the Musical Fidelity Amplifier thus falls into the category Hybrid amplifier and makes even based his appearance realized he with its congener, the all-tube amplifiers, only partly has something in common. Flask was glowing enthroned on the case you could not find completely in vain, instead, the reduction principle, packaged in modern industrial design, taken to the extreme: The solid metal front home just two controllers, two inconspicuous pushbutton, the IR sensor for the remote control and of course the (digital) display. In operation, this shines in bright green, the same is true for the under car illumination (!) Of NuVista 800, be partially barred inner life and of course the four NuVista tubes that are located at the rear of the housing. Science fiction associations are in this amplifier by no means far-fetched. 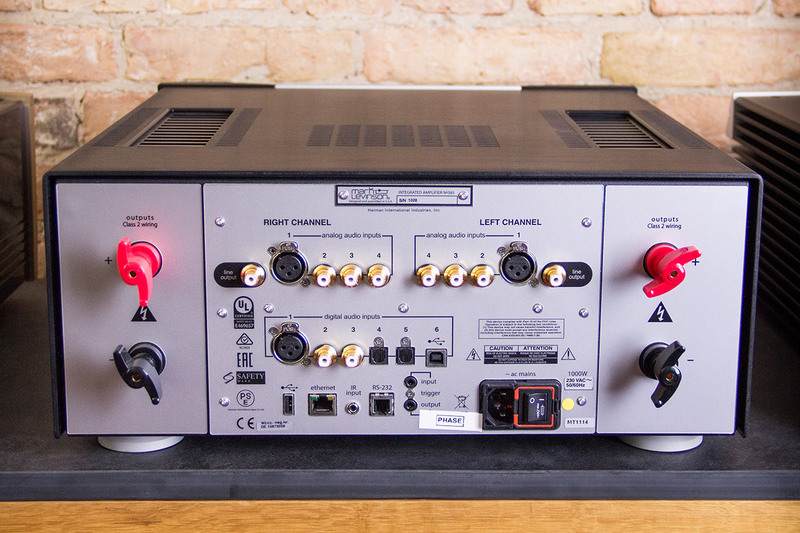 A glance at the rear reveals that allows the connection options of NuVista equally purist turn as the front already guessed: Per channel balanced XLR input is always present, beyond simply wait four pairs of unbalanced RCA inputs on incoming signals. As with the Mark Levinson No. 585 is constructed according to the dual mono principle of the amplifier circuit 800 NuVista. The power transistors are driven operating in Class AB and deliver powerful 300 watts into 8 ohms. We would come to the end of our survey about our three high-end integrated amplifiers that could hardly be more different in terms of both the technical approach as well as in terms of design and features. It can be seen again and again exciting to see how very different philosophies and concepts vary ultimately, when it comes to build an uncompromisingly good amplifier. So Accuphase E-600, Mark Levinson No. 585 and Musical Fidelity NuVista 800, this ideal all three models come each in their own way very close. I’m interested in your ML NO.585 Amplifier. Whats is the cost including shipping to UK?